The Air Force has bases across the U.S., including some joint bases with other branches of the military. Each base has a slightly different focus and mission of its own. Some are focused on training pilots, some on defense and specialized weapons systems, and some are part of the nation's space program. Here's a quick overview of domestic Air Force bases, listed in order by state. Located in Montgomery, Alabama, Maxwell and Gunter Annex are primarily academic-oriented installations educating entry-level Airmen through senior-level officers. Air University, the 42nd Air Base Wing and the 908th Airlift Wing are all located here. Located 26 miles southeast of Fairbanks, Eielson AFB is in the interior of Alaska, about 110 miles south of the Arctic Circle. It's home to the 354th Fighter Wing. A combination of the former Elmendorf Air Force Base and the Army's Fort Richardson, this base is located near Anchorage, the largest city in Alaska. It's is home to the 673rd Air Base Wing, the 3rd Wing, Alaskan NORAD (North American Aerospace Defense Command) Region, the 11th Air Force, and several Army divisions. This is a key Air Combat Command installation, located within the city limits of Tucson. Built in 1925, Davis-Monthan is home to the 355th Fighter Wing. The 56th Fighter wing is located at his base seven miles west of Glendale, Arizona, and about 15 miles west of Phoenix. It was built in 1940. This base in Pulaski County is home to the 19th Airlift Wing and the 189th Airlift Wing of the Arkansas Air National Guard. Both fly the C-130 Hercules transport aircraft. A base rich in history, Beale is at the forefront of the Air Force’s future in high technology. Its host unit is the 9th Reconnaissance Wing, and it's located near Marysville, California. Designated as the Air Force Flight Test Center (AFFTC), Edwards is the Air Force Materiel Command center of excellence for research, development, and test and evaluation of aerospace systems for the United States and its allies. Located in Kern County in southern California, Edwards is home to the 412th Test Wing and the closest Air Force base to Area 51. Headquarters of the Space and Missile Systems Center (SMC), part of Air Force Space Command, this base also is home to the 61st Air Base Group. 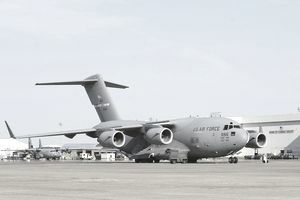 Located in Solano County, Calif., Travis handles more cargo and passenger traffic through its airport than any other military air terminal in the United States. It's home to the 349th Air Mobility Wing and the 60th Air Mobility Wing. This base's location near Lompoc, Calif., on the northern Pacific Ocean, makes it possible to easily launch satellites into polar orbit. It's home to the 30th Space Wing and the 381st Training Group. This base's host unit, the 460th Space Wing, falls under the direction of Air Force Space Command. It's also home to the 140th Wing of the Colorado Air National Guard. This base in Colorado Springs and the 21st Space Wing are the Air Force's only organization providing missile warning and space control to unified commanders and combat forces worldwide. Schriever AFB in El Paso County, Colorado is the home of the 50th Space Wing, the Space Innovation, and Development Center, the Missile Defense Agency's Joint National Integration Center, the 310th Space Group, and numerous tenant organizations. This is both a military organization and an accredited college for the undergraduate education of commissioned officers for the Air Force. The 10th Air Base Wing and the 306th Flying Training Group also are housed here, north of Colorado Springs. Located in the center of the Delmarva Peninsula in Delaware, the base is home to the 436th Airlift Wing and the Charles C. Carson Center for Mortuary Affairs, the largest military mortuary in the Department of Defense. Originally named Bolling Field, this Air Force base was merged with the Naval Support Facility Anacostia in 2010. It's in Washington, D.C. The Air Armament Center at Eglin in Valparaiso, Florida, is responsible for developing, deploying and sustaining all air-delivered weapons. It's also home to the 33rd Fighter Wing. This base near Tampa, Florida serves as headquarters for U.S. Central Command and U.S. Special Operations Command, and also is home to the 6th Air Mobility Wing. An Air Force Space Command base near Cocoa Beach, Florida, Patrick is home to the 45th Space Wing. it's also responsible for launches of unmanned rockets at nearby Cape Canaveral. The Air Force 23rd Wing, 93rd Air Ground Operations Wing, and 820th Base Defense Group are all located at Moody, which is just outside of Valdosta, Georgia. This base is the primary logistics support depot for the C-130, and also is home to the 78th Air Base Wing. It's adjacent to the Georgia city of Warner Robins, and both the base and the city are named for Gen. Warner Robins. This joint installation near Honolulu supports both Air Force and Navy missions in the Pacific. It serves as the headquarters for the Pacific Air Forces. Home of the 366th Fighter Wing and the "Gunfighters," Mountain Home is located between the Danskin and Owyhee Mountains, in southwestern Idaho. Named for Corporal Frank S. Scott, the first enlisted person to be killed in an aviation crash, this base in St. Clair County, Illinois is home to the 375th Air Mobility Wing. The 22nd Air Refueling Wing is based in McConnell, near Wichita, Kansas. It's also home to the KC-135 Stratotanker. Home of the 2nd Bomb Wing, Barksdale in northwestern Louisiana is also headquarters of the Air Force Global Strike Command. Andrews is home to Air Force, Army, Navy, and Marine units and hosts a chapter of the Civil Air Patrol. It is under the jurisdiction of the 11th Wing and is the home base of Air Force One, the president's aircraft. It's part of the Air Force District of Washington, located near Prince George's County, Maryland. This base in Bedford, Massachusetts is the home of the 66th Air Base Group and is part of the Air Force Life Cycle Management Center. Located near Columbus, Mississippi, this base is home to the 14th Flying Training Wing, and Air Education and Training Command. The 81st Training Wing of the Air Education and Training Command is at this base just outside Biloxi, Mississippi. The former Sedalia Glider Base, Whiteman AFB in Sedalia, Missouri, is the home of the 509th Bomb Wing, which operates the B-2 stealth bomber aircraft. Home of the 341st Missile Wing, Malmstrom is one of three Air Force bases that maintains and operates the Minuteman III intercontinental ballistic missile. Named for World War II prisoner of war Col. Einar A. Malmstrom, it's in Great Falls, Montana. The host unit at Offutt, near Omaha, Nebraska is the 55th Wing of the Air Combat Command. This base is home to the 99th Air Base Wing and the 57th Wing. This base is the result of the 2010 combination of the Army's Fort Dix, the Navy's Naval Engineering Station Lakehurst and the Air Force's McGuire Air Force Base. The 87th Air Base Wing is the host wing at this joint base, but it also houses the 305th Air Mobility Wing, the 621st Contingency Response Wing, the 514th Air Mobility Wing of the Air Force Reserve, the 108th Wing of the Air National Guard and the 57th Weapons Squadron. This base near Clovis, New Mexico is home to the 27th Special Operations Wing. Home to the 49th Wing and the 96th Test Group, squadrons at this base fly the military's only operational fifth-generation fighter, the F22A. Named for Col. George Holloman, this base is near Alamogordo, New Mexico. Kirtland is in southeast Albuquerque, nestled between the Sandia and Manzano mountain ranges., adjacent to the Albuquerque International Sunport. It's home to the 58th Special Operations Wing and the Air Force Materiel Command's Nuclear Weapons Center (NWC). Located in the southeast section of Goldsboro, North Carolina in the middle of Wayne County, this base occupies 3,300 acres and is home of the 4th Fighter Wing and the 916th Air Refueling Wing. Located in Ward County, North Dakota, this base is home to the 5th Bomb Wing and the 91st Missile Wing. Home of the 88th Air Base Wing, Wright-Patterson also houses the 445th Airlift Wing of the Air Force Reserve Command and is located near Dayton, Ohio. This base near Altus Oklahoma is home to the 97th Air Mobility Wing. This Air Force Materiel Command (AFMC) logistics complex is home to the 72nd Air Base Wing, the 552nd Air Control Wing, the 38th Cyberspace Engineering Installation Group and the 507th Air Refueling Wing. It's in Oklahoma City. The 71st Flying Training Wing is based at Vance, which is where airmen receive specialized pilot instruction. This base in South Carolina, the combination of Naval Support Activity Charleston and Charleston Air Force Base, is home to the 628th Air Base Wing. Shaw Air Force Base is located about 10 miles northwest of downtown Sumter, South Carolina, and within its city limits. Its host unit is the 20th Fighter Wing. This base near Rapid City, South Dakota, is home to the 28th Bomb Wing of the Air Combat Command (ACC), operating the B-1B Lancer, one of two bases in the Air Force to operate this aircraft. Named for General Henry "Hap" Arnold, this non-flying wing in Tennessee is the home of the Arnold Engineering Development Center, which has one of the largest flight simulation training facilities in the U.S. military. Part of Global Strike Command, Dyess, near Abilene, Texas, is home to the 7th Bomb Wing, one of only two Air Force B-1B Lancer strategic bomber wings. Home of the 17th Training Wing, this non-flying base near San Angelo, Texas trains members of all branches of the U.S. military in cryptology and intelligence. The largest of the Air Force's pilot training bases, Laughlin, located in Del Rio, Texas, is also home to the 47th Flying Training Wing. This base is part of Joint Base San Antonio, which also includes the Army's Fort Sam Houston, and-and Lackland Air Force Base. Randolph is the home of the 902nd Mission Support Group, and Lackland is the home of the 802nd Mission Support Group, and Air Education and Training Command. This is the processing station for new Air Force recruits entering basic training. The largest and most diversified training center in Air Education and Training Command, this base is named in honor of Texas Senator John Morris Sheppard, a supporter of military preparations before WWII. The base, in Wichita Falls, Texas, also is the home of the 82nd Training Wing and the 80th Flying Training Wing. Home of the 75th Air Base Wing and the 388th Fighter Wing of Air Combat Command (ACC), this base in northern Utah was the first operational F-16 base. A combination of Langley Air Force Base and the Army's Fort Eustis near Hampton Roads, Virginia is the home of the 633rd Air Base Wing. This base, under the operational control of the Air Mobility Command, is the home of the 92nd Air Refueling Wing and the 141st Air Refueling Wing of the Washington Air National Guard. A combination of the former McChord Field and the Army's Fort Lewis. It houses the Air Force's 62nd Airlift Wing and the 446th Airlift Wing. It's near Tacoma, Washington. Home of the 90th Missile Wing, this base near Cheyenne, Wyoming is also home to the 20th Air Force, a unit which is responsible for command over all of the Air Force's intercontinental ballistic missiles.